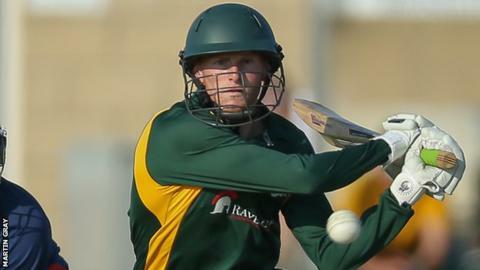 Guernsey topped their group in World Cricket League Division Six with a 44-run win over Suriname in Essex. David Hooper's 55, Matt Stokes' score of 42 and Tim Ravenscroft's 21 off 10 balls helped Guernsey reach 239 from their 50 overs. In reply, Muneshwar Patandin hit 100 for the South American side, who had won their opening two group games. But three wickets from Hooper ensured Guernsey remain unbeaten as they bowled out Suriname for 195 in 47 overs. Guernsey will face Norway in Friday's semi-final after they beat Norway in the other group. The island side have a perfect record after big wins over Fiji and Botswana to top their group and qualify for Friday's semi-finals.